Every year, I tell myself that I will be a “better” reader and that I’ll read more classics. Every year, I do manage to read a couple and, on the whole, really enjoy them. So why don’t I read more? Who knows? This year will be different! I’ve organized this challenge to work a little like a blog hop. I hope this will make it more interactive and enjoyable for everyone. 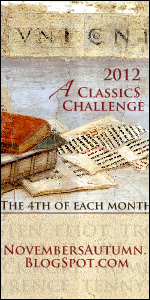 Instead of writing a review as you finish each book (of course, you can do that too), visit November’s Autumn on the 4th of each month from January 2012 – December 2012. You will find a prompt, it will be general enough that no matter which Classic you’re reading or how far into it, you will be able to answer. There will be a form for everyone to link to their post. I encourage everyone to read what other participants have posted. I’ve read many a review of this one and all of them have been glowing. An adventure novel set across France, Italy and the Mediterranean sounds perfect for reading in the summer. I got a really lovely book about Thomas Hardy from a UK publisher that I’m looking forward to getting into. Before I do, though, I think I should read something written by him…this is my random choice because it’s the one I’ve heard of the most! Does this count? I hope so! I know that generally it’s lauded as a great book and it’s about 50 years old so that’ll do for me. Plus, it’s sci-fi and I like sci-fi. My dad has been bugging me to read this for years. It would be nice if I could actually read it and make him happy. Plus, it’s another of those books that I know I should read. I had planned on getting to this when I did a readathon in October. I’m still kind of in the mood for ghost stories because it’s gloomy and blustery and they seem appropriate for that kind of weather. I have this on my eReader and quite fancy it (despite some less than glowing reviews that I’ve seen recently…). I went to see a film at the cinema a few years ago (that I think was called ‘Easy A‘) that referenced this book throughout. It was an amusing enough film and made me want to read this. Then I never got round to it. Described as a “romantic work of fiction in a historical setting” – sounds nice! Apparently it also explores legalism, sin and guilt. I think I’m looking forward to reading this the most!